The IMAX story is one of inventiveness, experimentation and success. Conceived by freelance cinematographer Graeme Ferguson and NFB producer and director Roman Kroitor in the fall of 1967, their goal was to create the world’s most sophisticated film projection system. Today, the Imax Corporation has grown to 136 theatres in 20 countries, with a backlog of 45 theatres scheduled to open during the next few years. The Sony IMAX Theater in New York is one of the highest–grossing screens in America and Sony will be opening IMAX 3–D theatres in Tokyo, San Francisco and Berlin. Cineplex is adding an IMAX screen in Chicago and Famous Players has announced plans to open Canada’s first state of the art IMAX 3–D theatre as part of a downtown Toronto entertainment complex that would include 14 conventional 35 mm screens. This level of corporate success has been a long time coming and what started out as a very clever idea to revolutionize film projection became a 25–year struggle to attain financial security. With that goal finally obtained, it is now just a matter of time before IMAX theatres will be found in every major market worldwide, just as Ferguson and Kroitor dreamed 30 years ago. Take One interviewed Graeme Ferguson when it was announced that the Imax Corporation had been given its long–overdue Academy Award for Technical and Scientific Achievement this past spring. Ferguson not only cofounded the company, he has also been responsible for producing and directing some of its most successful films: North of Superior (produced, directed, photographed and edited, 1971), Man Belongs to Earth (produced with Kroitor, 1974), Ocean (produced and directed, 1977), Hail Columbia! (directed and photographed; produced with Kroitor, 1982), The Dream Is Alive (produced and directed, 1985), Blue Planet (produced, 1991), Destiny in Space (produced, 1994) and Into the Deep (produced, 1994). How did you get started in your career as a filmmaker? When I was a student, there were essentially very few ways of learning filmmaking. The NFB set up a very good program in which they went across the country each year and chose about a dozen students in Canadian universities who came and worked at the Film Board for the summer. I was at the University of Toronto and was chosen as a summer student in 1951. I was chosen for the camera department. One of the other summer students in the department was Michel Brault and in the production department the summer students included Roman Kroitor, who later became my brother-in-law. The other tie to all of that was in my high school days in Galt, Ontario. One of my classmates was Wolf Koenig, and so Wolf and I had been enthusiastic about photography as high schooled students, and Wolf had good luck. He got pulled off a tractor and sent to the NFB. He started at the bottom as a splicer and ended up as one of its finest filmmakers. You ended up in New York in the mid–1960s as a freelance cameraman on Rooftops of New York, which actually got an Academy Award nomination for Best Short. How did you come to work on Polar Life for Expo 67? Roman has asked me to consult for a day or two on Labyrinth when he was first conceiving that film. I had done a fair amount of filming in the Arctic and Alaska and so it wasn’t a startling idea, but I nothing particularly to show the committee, so I showed them The Love Goddesses, which couldn’t be a more remote film from what they were asking me to do. They said okay, “We’ll hire you to go and wander around the Arctic, but give us a film on the polar life.” I hadn’t worked in 3–D, but I thought it would be kind of nice to do the Arctic in 3–D for Expo. They were designing Expo ’67 at the same time that the New York World’s Fair was going on, and the New York World’s Fair had some wonderful examples of multi–image, multi–screen and, of course, there was a whole tradition of that going back through the Expo’s in Europe and the American exhibit in Moscow. So a lot of people had been working on this idea. It really goes back to the beginning of cinema. When and where was the idea for IMAX hatched? It was right after Expo. I was up in Montreal in August, and Expo was very popular. It was obvious to us that there was a big audience. And it wasn’t just because it was multi–screen. It was because we had the screens bigger. Because we had more projectors to fill the bigger screens as well as the multi–images. So, I was at Roman’s house one afternoon and he and I started discussing the fact this this was very successful, but a very cumbersome way to project the films. We said to each other: “Wouldn’t it be better to have or been able to have a single, large–format projector to fill a large screen. Obviously the next step was to have a larger film format, larger than anything that had ever been done. We talked for about an hour, and within that hour we had sketched out the screen size that could be used and the film format that would be capable of doing that. The idea of a horizontal, 70 mm film format with 15– or 16–perf pull across was really figured out in the first few minutes. We said to ourselves, “Let’s invent this new medium.” To do that, we needed a company. When I had made Polar Life, I chose a very experienced businessman, an old high school colleague named Robert Kerr. He printed all the reserve seat tickets for the Maple Leaf Gardens in days. He was also the mayor of Galt. So when I was going to make Polar Life, I asked Robert to be my business partner. He had never made films before, but he was my business partner through Polar Life. it was not only a very popular film, but we actually made it for less than budget, so we made a bit of money out of it. I called Robert and about a week or two later we met in my office in New York on evening. the three of us sat down and decide to set up a company. Robert was in Galt, Roman was in Montreal and I was in New York. We didn’t even have one headquarters. We started out with three people in three different places. We agreed to set it up as a Canadian company, and so Robert went back to Galt and set up the company. I think if you look at the incorporation date, it would be September, 1967. We did that all within a few weeks. So the 30th anniversary of IMAX is actually September (1997). Where in the name IMAX come from? That came a year or two later. We first called the company Multiscreen Corporation because that, in fact, was what people knew us as. But the main thing is that we called the system Multivision because we saw it as a large–screen way of showing multi–image films. It was with multi–image that we had a great success in, and we thought that was the central thing to do. Not the only thing, but the central thing. After about a year, our attorney informed us that we could never copyright or trademark Multivision. It was too generic. It was a descriptive word. The words that you can copyright are words like Kleenex or Xerox or Coca-Cola. If the name is descriptive, you can’t trademark it so you have to make up a word. So we were sitting at lunch one day in a Hungarian restaurant in Montreal and we worked out a name on a place mat on which we wrote all the possible names we could think of. We kept working with the idea of maximum image. We turned it around and came up with IMAX. How did you transform your idea into a working model? Although neither Roman, Robert or I were engineers or even very technically oriented or skilled, we knew what technology we would need. One of the things we knew is that you couldn’t take a standard movie projector and just scale the whole thing up and run a big film. So we knew that we would need to find a new projector movement. Roman and I had gone out to Los Angeles to look at a movement that was being used there in some high–speed printers. One evening we went to dinner at my old friend, Jean–Philippe Carson. Jean-Philippe and I had worked together in film in my freelance days and now he was running the Eclair Corporation of America. He said he had just read a little, one–paragraph extract in a publication that described a new film movement that had just been invented in Australia. So we said this looks interesting, why don’t we find out about it. Jean–Philippe and Robert called Ron James, the inventor, in Brisbane. I think Ron was essentially a man who serviced projectors; a very bright man. We called him up and asked, “Have you sold the rights?” He said, “No, not yet, but I’ve had a couple expressions of interest, but I haven’t actually sold the rights.” Jean–Philippe and Robert flew to Brisbane, met with Ron, and acquired the patent rights to his invention. We didn’t have much money, so we paid for it over some time. he had a set amount he wanted. I don’t remember the exact amount, but it was a rather odd number. We asked, “Why do you want that?” He said, “I want to build a little house up in the hills and that is the amount it will cost me to build it.” He was in his sixties by then and he wanted to retire. So we paid him the amount over time and then for the rest of his life he continued to consult with us, helping us develop his invention, which he called a Rolling Loop. Now you had the idea and a patent, but how did you actually build the projector with its Rolling Loop? We were not terribly smart and we thought we would just find somebody to build the projector for us. After thinking about it for a couple of weeks, we became more astute and we came to the conclusion we would need an engineer to help us. And who was the best engineer? That was Bill Shaw. Bill had been in the same high school as Robert and myself in Galt and was now the chief engineer at CCM, which in those days was the principle builder of sports equipment in Canada. Robert and I went to see Bill and asked him to quit his job and come to work for us. We had no money, but we had an idea for the world’s most sophisticated motion picture projector and the most sophisticated camera. This was the challenge. Bill quit his job at CCM and came over to us in 1968. The interesting thing is that we were all in our forties and what has been commented on since then is that we would never have done this earlier or later in life, because each of us had had a successful career and we were confident in our abilities. But if that career went on for the rest of our lives, it would not be so interesting. When you get someone in their forties, it’s a very good time to try sometime new, if you have been successful. For us, it was a very good moment. Bill had never been in a projection booth when we hired him, so the first thing for him to do was study conventional projectors. But this was a big advantage, because he had no preconceived notions of how a projector should work. Bill knew that McMaster University [in Hamilton, Ontario] had a program to support industry, so if a company wanted to develop something new, it could be done at McMaster in conjunction with the engineering faculty. They took us under their wing and gave us a lab and a supervising professor, and the first project was built at McMaster. That projector went to Osaka for the World’s Fair in 1970 and came back to Ontario Place. Ontario Place was built on the Toronto waterfront directly after Expo, with its geodesic dome and large–screen theatre. We had money from Fujifilm in Japan for the World’s Fair, which helped build the projector. We also received a small amount of money from the Federal government, but we were very short of money. We could see that we would have difficulty in meeting the company payroll very soon. I went to Chris Chapman [the Toronto filmmaker who had made A Place to Stand for the Ontario pavilion at Expo] and told him we were in trouble and might go under soon. Chris said, “There is something going on that you may not know about, but it might be helpful. The Ontario government is going to build an entity called Ontario Place. There will be a large–screen theatre and the architect is Ed Ziedler. They haven’t figured out exactly what they are going to show in there, but they do want a large–screen theatre.” So he set up a meeting for me with James Ramsay, who was the civil servant who oversaw the building of the Ontario pavilion at Expo, and he was now overseeing the building of Ontario Place. We would bring the projector back from Japan and have a wide–angle lens designed for it. That theatre, in fact, would become the prototype for all IMAX theatres today, with its deep–sloped seats and surround sound. Not only did Ramsay buy the projector from us, but he commissioned the first IMAX film for Ontario Place. He was commissioning films from various Ontario filmmakers for various parts of the province. He had divided up the province in his mind and each filmmaker was given a section. He said to me, “You can have from Wawa to the Manitoba border and up to, but not including, the shoreline of Hudson’s Bay,” because he had given that to another filmmaker. I had never been given a film with less detailed instructions, which is great for a filmmaker because the less detail you get, the more freedom you have. That film was North of Superior, which was basically your film, wasn’t it? I produced, directed, shot and edited it. It set a standard, creating a new way of experiencing cinema, and it was hugely popular with the audiences. The reason was that for the first time the audience felt immersed in the film. Wherever the camera was, the audience felt “in” it. And to this day that remains one of the dominant characteristics of IMAX, to be able to put the audience in the picture. The use we primarily conceived for IMAX, for multi–images, didn’t put the audience in the picture. Instead, what it did was to present cinema in a sort of metaphorical way, so you could see two or more images and your mind would combine those two images to create, in a poetic sense, a whole out of the parts. Intellectually, what we were trying to do was more interesting, and certainly was interesting if you go back and look at those Expo films. They worked dramatically and intellectually. They were very stimulating, What we did with North of Superior was less intellectual, more gut reaction to what had been done in the days of Cinerama. The motion of swooping over the cliff, everyone remembers that. The audience would experience a sudden drop, like a rollercoaster ride. In the days of Cinerama that was called a Kinesthetic effect, and I knew that I had that tool to use because Robert Gaffney, who I had gone to for advise on the camera, had done extremely successful work in Fortress of Peace and Sky over Holland. He had taken a 70 mm camera and put it in the nose of an airplane and made people airsick. So we knew we had a tool that we could use. However, the reaction time to anything is always rather longer than the inventor can ever imagine. You think you might have built a better mouse trap and the world will come to your door the next morning. But they will beat the way to your door about five years later, that’s how it really works. So there are many inventions, like Xerography, which took many, many years between the invention and the widespread use. What happened is that the film industry did not got to Osaka to see what was going on, but once we got to Ontario Place, they began to come—exhibitors, producers and directors—to see what we had and whether they could use it. We had many discussions with studios and filmmakers. Most were initially promising, but it would always bog down over the time it would take to build enough theatres. If Ontario Place was beginning to look like a one–shot thing and you didn’t have the capital to pop these theatres across the countryside, what kept you in business? It was a deep searching look into ourselves. Within about a couple of years, a few people came along and said they wanted to use IMAX. One of the first was the U.S. government who wanted to put it into Expo ’74 in Spokane, Washington, and Roman and I produced a film that I directed called Man Belongs to Earth with Chief Dan George. It, again, was successful. Roman had previously made Lonely Boy, and Paul Anka’s manager had subsequently became the owner of the Ringling Bros. Barnham and Bailey Circus. Roman persuaded him to put an IMAX theatre in Circus World and commissioned Roman to make a film called Circus World in 1974. So, we had a couple of things that kept us going, but the money kept getting thinner and thinner, and we finally had to face the fact we had failed in our efforts to attract a big financier. So in the spring of 1974 we decided to change the company’s strategy. The decision was that the company had to start marketing. That meant we were going to go out and find customers one by one who could put our projectors in theatres such as Ontario Place and Circus World, places that didn’t rely on a chain. Essentially, for the next several years the company was in the business of marketing theatres one by one. The second thing we were trying to do was to make films that explored the medium. For example, somewhere in the 1980s we got interested in trying to take the camera in space. Subsequently, you produced a series of four IMAX space films: Hail Columbia! (1982), The Dream Is Alive (1985), Blue Planet (1990) and Destiny in Space (1994). It’s just about exploring what the medium can do. If you look at Roman’s films and my films, you’ll see that it’s a common thread to try and do different things with the medium. People kept telling us nobody would sit still for 90 minutes and watch an IMAX film. We were told that endlessly, and of course our original concept was to make feature films. We’ll never get this breakthrough into feature films if people kept on thinking that you can’t sit for 90 minutes. So we made feature–length films, if not traditional features. One was Rolling Stones at the Max and the other was Titanica, both 90–minute films. One is a concert film and one is a docudrama that Stephen Low made. If you go back in docudrama, one of the first was Circus World in which Roman had lots of dialogue. Is this the realization of your dream, to make features in IMAX? I want to talk about selling your business to U.S. interest. Was this your only choice? If you go back to 1967, 30 years ago, none of us was under the illusion that you invent a new medium unless it was a worldwide medium. We understood from the beginning that we must make films that would appeal to audiences worldwide. Very early the idea of making of what we tend to pergoritively call crossover films, and a crossover film meant one that could play just about anywhere. So from day one, it was never our intent to make the medium for Canada alone. However, we probably have the greatest penetration in Canada then anywhere in the world. There are more theatres per population in Canada, but we always saw ourselves as an international company. By the late 1980s, we still had no significant financing. We were still the owners and we all were about turning 60 at that point. We said we’ve got to turn this company over to the new generation of management, and ideally an owner/manager. So we set up a serious search for how to move the company into its next phase. We explored in Canada, Japan and the United States. Brad Wechsler and Richard Gelfond were different from the others we looked at. They were quite a bit younger. They had some motion–picture background, Brad was on the board of MGM, but their main background was in finance. They worked on Wall Street and they could bring the enthusiasm of youth. They just had the drive, maybe the original drive we had ourselves. It worked out with Brad and Rich and with Douglas Trumble (the special–effects wizard). Within weeks they had gone out and got major debt financing, so for the first time there was money in the bank. We never had money in the bank. They put money in the bank immediately and took the company public on the NASDAQ and the Toronto Stock Exchange, all within six or seven months. When people ask me if I made the right decision, I say if I had to make it over again today, I would make the same decision. We have have any alternative. After all those years there were not a lot of people beating down the door. The company has not left Canada, but it was high time it became a public company. My guess in five years Imax will still be a company functioning in Canada and it will be owned on the stock exchanges. I would disagree that we sold our technology to the Americans, I would say we have international funding, which we should have had from day one. What do you see for the future of the process you set in motion 30 years ago? It was only when Stephen Low, Colin’s son, made The Last Buffalo for Expo ’90, that it really dawned on us that IMAX 3–D was a major element in our future. With that one film, theatres began to convert to 3–D. I was quite surprised how fast they converted, and to this day we are building more 3–D theatres than 2–D and the trajectory seems to be in that direction. One of the challenges for the company right now is to get more 3–D films into production, so we can supply films for those theatres. So I think for the next few years 3–D will be a major part in the company’s growth, and we are all moving, inevitably, much faster toward computer graphics than we ever imagined. Back to Graeme Ferguson’s filmography. 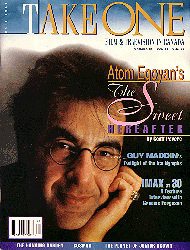 Wyndham Wise is the former publisher and editor-in-chief of Take One: Film in Canada. This interview was originally published in Take One, Issue No. 17, in the Fall of 1997. Northernstars.ca acquired the archives of Take One in 2007.